You are here: Home / Weekly Columns / Opinion / Three Reasons To Buy the Razer Phone 2 and One Reason To Skip it. Three Reasons To Buy the Razer Phone 2 and One Reason To Skip it. (ThyBlackMan.com) The Razer Phone 2 is now available and you’ve probably heard a lot of people praising and criticizing it. Buying a smartphone is a choice of taste. Some people like big screens, others want headphone jack. Some people want the latest hardware and more RAM, while others focus more on the software. Putting everything in a box is not easy and that’s why when you’re in the market, it’s important to know the good and the bad about the phone you’re thinking of buying. If you’re confused and don’t know whether buying the Razer Phone 2 is a good idea or not, here’s a guide to help you. We have listed three best things about the Razer Phone 2 and one worst thing. Let’s see how it is to keep the guesswork out. The Razer Phone 2 sports a 120HZ LCD panel. It is the same as the last year’s panel, but Razer has improved the display brightness by 50 percent. The display size is 7.2 inches and the 120Hz refresh rate makes interactions buttery smooth. In the Android space, the Razer Phone 2 is the smoothest and most fluid smartphone. Razer phones are all about high speed and quality. The first Razer Phone was also a powerful device and now the Razer Phone 2 continues the same trend. The phone comes equipped with a Snapdragon 845 chip and industry’s best DDR4 8GB RAM. The internal storage capacity is a bit low with 64GB, but a memory card slot solves the shortage of storage. If you compare the Pixel 3 XL with the Razer Phone 2, you will notice that the latter has better speakers and it offers excellent sound quality. The front-facing dual speakers are powered by Dolby Atmos and the speakers also support HDR and Dolby 5.1 surround sound content. The phone lacks 3.5mm headphone jack, but it offers a Type-C DAC so you can enjoy 24-bit audio on headphones. The Razer Phone 2 comes with a 4000mAh battery that lasts for a day. We can’t expect more from the phone because the display technology used in the device requires more battery juice. That said, an illuminated Razer logo with RGB light support is no doubt a battery killer. The illuminated logo is a creative idea as you can set multiple colors of your choice and also sync the lighting with notifications, but overall, a 4000mAh battery for this phone is really a bad thing since the phone is designed for gaming purpose. We haven’t included pricing and lack of headphone jack in our list of reasons to skip Razer Phone 2. The reason for the same is some people find it affordable, not because $800 don’t matter to them, but if we look at the competition, it is not like we have just started seeing smartphones in this price range. Smartphones like Galaxy S6 Edge were available for an even higher price than this one. It’s true that options were less at that time. Today, we can get components like Snapdragon 845 on even cheaper smartphones from companies like OnePlus, Xiaomi, and Asus, but Razer Phone 2 is not ‘really’ an overpriced phone if we compare it with the other smartphones in the same range. 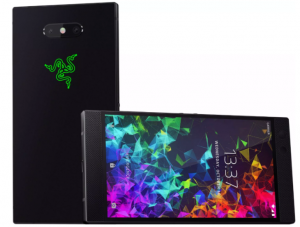 The design of the Razer Phone 2 has disappointed many people because it looks like the company has packed all new features in a dated shell. The good thing about the design is that there’s no notch and the quality of the display is excellent. The first Razer phone was not so good for outdoor usage, but this phone, with improved display brightness, can be used anywhere. The camera technology used in the phone makes it worth buying, and most importantly, it is a phone for gamers and it does what it says.